If you didn't blink, earlier today there was an image of the new 2010 Olympic torch on the Globe and Mail's homepage. Suddenly it was down, replaced with images of runners in a media scrum. Too bad. I wanted to see the torch, not the PR that surrounds it. But behold! I had the image bookmarked, so here it is... the new 2010 Olympic Torch! 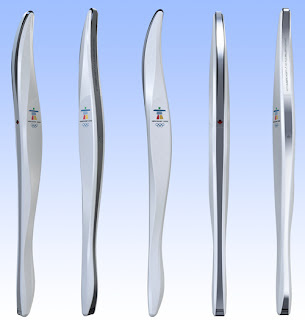 Inspired by the tracks left by snow sports on snow and ice, the 2010 Olympic Torch is a gorgeous example of creative thought. They could have easily designed another boring torch, but nope, VanOc went for bold and different. Leo Obstbaum, director, Design designed the torch for Canadians, saying, "When they hold it in their hands, I want them to be proud." Bombardier (yes, that Bombardier) provided an industrial design team for the project. To find out more about the Torch Design, check out the article on the Vancouver 2010 site.